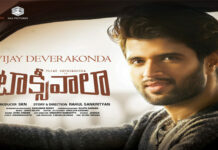 Geetha Govindam Censor Report: Vijay Devarakonda’s Geetha Govindam Movie which is touted to be a romantic comedy entertainer wrapped up its censor formalities with a U/A certificate. With this, entire post-production formalities completed and the film will hit the theatres on the 15th of Aug as Independence day special. Rashmika plays the female lead in this film which has been directed by Parasuram. Music Composed by Gopi Sundar and Produced by Bunny Vas under the banner of GA2 Pictures.